Lina, the Slayer, is a ranged intelligence hero that wields extremely powerful fire magic. With her arsenal of fiery spells, Lina can lay waste to single targets and entire teams alike, incapacitating them before burning them to ashes. Her first ability, called Dragon Slave, summons a fiery dragon that travels a fair distance ahead of Lina. Any enemy unit it comes into contact with is dealt a considerable amount of magic damage, making Dragon Slave a bread-and-butter area-of-effect nuke. Aside from scorching heroes in its wake, Dragon Slave is also typically used to clear creep waves—which means that it serves as Lina’s primary farming tool. Light Strike Array, her second ability, conjures a column of flame in a 225-unit radius after half a second of cast time. All enemy units within its radius are stunned for up to 2.5 seconds, and take a moderate amount of magic damage. Used properly, Light Strike Array can disable several heroes all at once, allowing Lina and her team to follow up without much trouble. It is, however, quite difficult to land due to the on-cast delay, and its small radius makes it somewhat easy to dodge. Complimenting her first two abilities is Fiery Soul, her only passive ability. Whenever Lina casts a spell, Fiery Soul grants her greatly increased movement speed and attack speed. The buff can stack with itself three times, which causes Lina to become a fast-moving flamethrower, if you will. Fiery Soul actually allows Lina to play a physical carry-like role in the team, despite being designed primarily as an offensive spellcaster. Her ultimate ability, named Laguna Blade, is one of the strongest single-target direct damage spells in the game—easily deleting support heroes and similarly soft targets in one fell swoop. Firing a white-hot bolt of lightning at her prey, Lina deals up to 850 magic damage in one go, blasting that hero into the afterlife in the blink of an eye. Laguna Blade makes Lina a very dangerous ganker and teamfighter, with the capacity to remove key heroes from engagements before they or their teammates can retaliate. Despite her obvious prowess in the arcane arts, however, Lina is not an invincible sorceress by any means. In fact, she is one of the most fragile heroes in the game, exacerbated by the fact that she has no true escape mechanisms other than Light Strike Array. If she ever gets chain stunned or chain disabled, it’s usually curtains for her. Also, her cast and attack animations are extremely slow, which makes it easy to predict some of what she might do next. Finally, she is quite difficult to play, due to the fact that Light Strike Array requires some prediction in order to land. Lina’s skill progression will largely depend on which role she is playing. 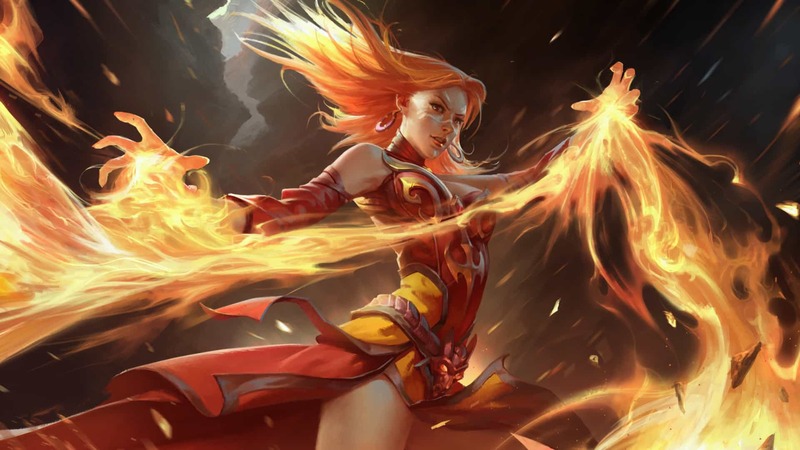 Although support Lina is common among new players, she also has the option of going solo mid, and settling into a semi-carry role thanks to her nukes. Thus, we will lay out both of these builds in this guide. Note that in either build, Dragon Slave will be maxed out first. For support Lina, we recommend spending your first skill point on Light Strike Array. This is so that you can assert dominance over the initial bounty rune spawns, and possibly even go for an early first blood attempt if your team’s hero composition is conducive to it. Light Strike Array likewise helps you protect your teammates from any early dive attempts. From there, you’ll want to invest heavily in Dragon Slave, with a single value point in Fiery Soul at Level 4. Be sure to take Laguna Blade at Level 6 as well. Going into the mid game, Light Strike Array should take priority over Fiery Soul, in order to maximize its stun duration and damage output right away. Fiery Soul isn’t really that important to support Lina, anyway, since she isn’t supposed to be responsible for putting out physical damage. Thus, it takes the backseat in this build. As for core Lina, the priority order for the mid game is reversed. Dragon Slave is still maxed out in the laning phase—but instead of Light Strike Array, Fiery Soul is placed center stage from Levels 8-11. This is because Light Strike Array is used more as a setup tool rather than a straight up nuke when playing core Lina, with Fiery Soul’s attack speed buff making up for the loss in magic damage. Regardless of the path you choose, though, Laguna Blade should always be taken at every ultimate level. Fortunately, Lina’s usual item build is a lot simpler than picking between her two skill builds. The only real difference between support and core Lina in terms of items is that the former usually involves buying wards and other team-focused consumables along the way. Core Lina, on the other hand, skips straight to the good stuff with the farming pace enabled by Dragon Slave and Light Strike Array. In the early game, we recommend purchasing a Magic Stick, which is great on Lina because of her natural fragility and her high-cost spells. Magic Stick provides plenty of restoration, both for health and mana, which will help her get through the laning phase nicely. If you are playing Lina in the mid lane, a Bottle would also be a good idea, especially if your teammates can help you ward the rune spawns. After acquiring both items, purchase a pair of boots to get yourself geared up for the rest of the laning phase. Buying multiple Null Talismans is also recommended, as they make scoring last hits and harassing your opponent out of the lane much easier. Going into the mid game, you’ll want to choose between either Power Treads or Arcane Boots as your boots upgrade. Power Treads is suited more for core Lina thanks to the bonus attack damage, while Arcane Boots helps support Lina supply her team with mana to spam their abilities with. Once that’s done, you can proceed to building up your core items. Eul’s Scepter of Divinity is one of the most popular choices in this regard, thanks to the active ability being perfect for setting up combos on single targets. The passive benefits are perfect for Lina as well, who wants more movement speed and mana regeneration to work with. Alternatively, you might also want to consider a Bloodstone, which bolsters Lina’s tiny health pool and gives her all the mana regeneration she could ever want—with enough charges, that is. Blink Dagger is another good pickup for the mid game, as it gives Lina some much-needed mobility. With it, she can hang back with her team as they prepare for a gank attempt or teamfight initiation, then blink in with Light Strike Array in tow before the enemy is able to react accordingly. It also gives her an escape mechanism, thus reducing her reliance on Light Strike Array in order to evade enemy heroes. After the mid game, situational pickups come into play. Aghanim’s Scepter causes Laguna Blade to slice straight through magic immunity, allowing the ability to retain its relevance well into the late game against Black King Bar wielders. Ironically, BKB is great on Lina, since the magic immunity allows her to fire rapidly without getting disabled in between. Crystalys greatly amplifies your physical damage, and its critical strike will trigger plenty thanks to the attack speed bonus from Fiery Soul. Later on, it can be upgraded to either a Daedalus or Bloodthorn, depending on what might serve the team better. On the other hand, a Scythe of Vyse might be better for controlling certain heroes, especially those that can simply purge Bloodthorn’s silence effect with BKB or Manta Style. Octarine Core is an excellent option for deep late game scenarios, thanks to the massive boost in stats and the spell lifesteal mechanic. The cooldown reduction also increases your magic damage output, and helps you stay on top of your Fiery Soul stacks. Meanwhile, Shiva’s Guard helps you and your team deal with opposing carries, thanks to the passive attack speed slow aura and the kiting potential of the active ability. Lina’s combo doesn’t really change all that much, with extra steps only being added depending on whether or not you have a mobility or setup item in your inventory. Otherwise, it’s really just a matter of using those items first, then following up with Light Strike Array, Dragon Slave, and Laguna Blade in that order. This should be more than enough damage to kill most heroes, but for those that survive, all you have to do is lay into them with your Fiery Soul-buffed attacks. And that’s it, really. Simple as they come. The hard part, of course, is landing Light Strike Array—especially if you have to do it manually without any assistance. In such a case, try to predict where your targets might be going, so that you can catch them as they attempt to juke your stun. It’s easier said than done, though, and takes a lot of practice to master. Lina’s squishiness is her worst enemy. She is basically made out of wet paper, and will fall quickly if caught in a chain of stuns and/or disables. Drafting heroes that can lock her down or prevent her from casting spells is a great idea, which means that picks like Night Stalker, Silencer, Sven, Kunkka, and other similar heroes work well against her. Orchid Malevolence wielders like Storm Spirit and Queen of Pain can also jump and silence her before she can react—though this becomes somewhat less of a threat once she acquires a Eul’s Scepter. She also has trouble dealing with magic immune targets, at least until she is able to purchase an Aghanim’s Scepter or a Scythe of Vyse. Lifestealer, Omniknight, and heroes that carry Black King Bar can all shrug off her spells, which means that Lina herself becomes practically helpless against them. Her dependence on mana is also one of her shortcomings, which can be exploited by a number of heroes. Nyx Assassin can strip her of a significant amount of mana at all stages of the game with Mana Burn, while also stunlocking her with Impale and Spiked Carapace. Lion can Mana Drain her resources away while she is incapacitated with Hex and/or Earth Spike. Anti-Mage shreds her mana pool to bits with Mana Break, and punishes her use of spells with Mana Void. Diffusal Blade wielders like Faceless Void and Mirana can likewise take her mana away with auto attacks, while also keeping her in place with the slow from the active ability.